The Aero Spacelines Super Guppy is a large, wide-bodied cargo aircraft that is used for hauling outsize cargo components. It was the successor to the Pregnant Guppy, the first of the Guppy aircraft produced by Aero Spacelines. 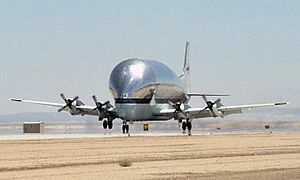 Five were built in two variants, both of which were colloquially referred to as the "Super Guppy". The first, the Super Guppy, or "SG", was built directly from the fuselage of a C-97J Turbo Stratocruiser, the military version of the 1950s Boeing 377 "Stratocruiser" passenger plane. The fuselage was lengthened to 141 feet (43 m), and ballooned out to a maximum inside diameter of 25 ft (7.6 m), the length of the cargo compartment being 94 ft 6 in (28.8 m). The floor of the cargo compartment was still only 8 ft 9 in (2.7 m) wide, as necessitated by the use of the Stratocruiser fuselage. The Apollo 11 Command Module is loaded aboard a Super Guppy at Ellington AFB for shipment to North American Rockwell Corporation at Downey, California. In addition to the fuselage modifications, the Super Guppy used Pratt & Whitney T-34-P-7 turboprop engines for increased power and range, and modified wing and tail surfaces. It could carry a load of 54,000 pounds (24,000 kg) and cruise at 300 mph (480 km/h). The second version was officially known as the Super Guppy Turbine (SGT), although it used turboprop engines like the first Super Guppy. This variant used Allison 501-D22C turboprops. Unlike the previous Guppy, the main portion of its fuselage was constructed from scratch. By building from scratch, Aero Spacelines was able to widen the floor of the cargo compartment to 13 ft (4.0 m). The overall cargo-compartment length was increased to 111 ft 6 in (34.0 m), and the improved fuselage and engines allowed for a maximum load of 52,500 lb (23,800 kg). These design improvements, combined with a pressurized crew cabin that allowed for higher-altitude cruising, allowed the SGT to transport more cargo than its predecessors. The SGT retained only the cockpit, wings, tail, and main landing gear of the 377. The nose gear was taken from a Boeing 707 and rotated 180 degrees. This dropped the front of the aircraft slightly, leveling the cargo-bay floor and simplifying loading operations. In the early 1970s, the two Super Guppy Turbines were used by Airbus to transport aeroplane parts from decentralised production facilities to the final assembly plant in Toulouse. In 1982 and 1983, two additional Super Guppy Turbines were built by Union de Transports Aériens Industries in France after Airbus bought the right to produce the aircraft. The four Super Guppies have since been replaced by the Airbus Beluga, capable of carrying twice as much cargo by weight. Aero Spacelines B-377-SG Super Guppy, prototype of a much enlarged version of the Guppy using C-97J components, powered by four Pratt & Whitney T-34-P-7WA turbo-prop engines. Aero Spacelines B-377-SGT Super Guppy Turbine (Guppy 201), production version powered by Allison 501-D22C turbo-prop engines, using an enlarged cargo section built from scratch instead of being converted from original C-97J components. All Super Guppies remain either in service or on display. Super Guppy N940NS (previously N1038V), serial number 52-2693, is on display at the Pima Air & Space Museum adjacent to Davis–Monthan Air Force Base in Tucson, Arizona, US. Super Guppy Turbine F-BTGV (formerly N211AS), serial number 0001, is on static display at the British Aviation Heritage Centre, Bruntingthorpe Aerodrome, United Kingdom. Super Guppy Turbine F-BPPA (formerly N212AS), serial number 0002, is on static display in the Musée Aeronautique Aeroscopia near the Airbus facility, Toulouse-Blagnac, France. Super Guppy Turbine F-GDSG, serial number 0003, is on static display at the Airbus facility, Hamburg Finkenwerder Airport, Germany. Super Guppy Turbine N941NA (formerly F-GEAI), serial number 0004, is in service with NASA as a transport aircraft and is based at the El Paso Forward Operating Location at the El Paso International Airport, in El Paso, Texas, US. ^ a b c d e f g h i Taylor, Michael J. H. (1989) . Jane's Encyclopedia of Aviation. London: Crown. ISBN 0-517-69186-8. ^ "All About Guppies". Retrieved April 1, 2011. ^ a b "Johnson Space Center Super Guppy". NASA.gov. April 7, 2002. Retrieved July 18, 2013. ^ "Super Guppy". Pima Air & Space Museum. Retrieved 19 May 2014. ^ Gray, Robert (August 4, 2011). "After shuttle, NASA's plans for El Paso". El Paso Inc. Retrieved July 18, 2013. ^ Mondey, David (1981). Encyclopedia of The World's Commercial and Private Aircraft. New York: Crescent Books. p. 9. ISBN 0517362856. Wikimedia Commons has media related to Aero Spacelines Super Guppy and Aero Spacelines Super Guppy Turbine.